Over the years we’ve seen many companies try to beat the success of Pokemon, each with their own set of cuddly and heavily market researched monsters. 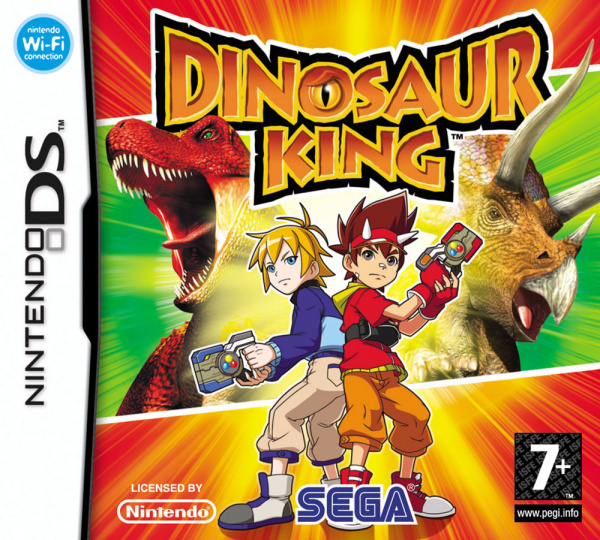 Of course, nobody can beat Nintendo at their own game, but that hasn’t stopped Sega trying with Dinosaur King, based on a popular 4kids cartoon series, as well as arcade and (naturally) trading card games. 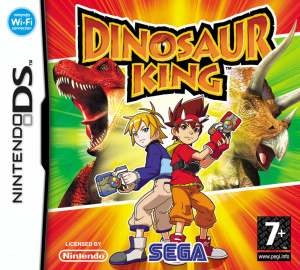 If you’ve ever played a Pokemon game you’ll be right at home with Dinosaur King. You select a character at the start from two rivals and use your DinoShot to collect and raise different dinosaurs, each with special attacks and attributes. So far, so familiar, but it innovates in a number of key areas, particularly combat. Battles are turns-based, with each character selecting a move represented by rock, scissors and paper (Alex Kidd fans rejoice!) If your move beats your opponent’s, you inflict damage and he is helpless, and vice versa; in a draw you both receive partial damage. Even though rock, scissors paper sounds too unpredictable to create a decent combat system around, before each move your opponent will often give you a clue as to their next move. At the beginning it’s as clear as “I will try a critical move next!”, but later on they become more cryptic and you have to play more carefully, preparing for bluffs and critical moves. It’s a surprisingly deep and enjoyable system once you learn its mannerisms, although the inability to heal your dinosaurs in-battle limits your options to hit or be hit. After levelling up you often unlock new move cards to equip, which vary from more powerful versions of simple attacks to moves that increase in damage when your health is low, or give you strong elemental damage against certain dinosaurs. There’s a good range of moves, and you can share them amongst your team, which helps to level up your weaker dinosaurs more quickly. You probably wouldn’t expect much archaeology in a Sega game, but Dinosaur King surprises with a fun minigame to clean up your fossils. Using the stylus you chip away at the rock covering your dino bones, and blow into the microphone to clear the build-up of dust. 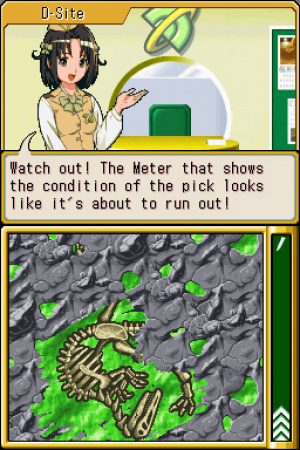 It’s difficult at first to unearth the complete fossil without breaking your pick, although there’s no penalty for doing so, which makes the whole event rather pointless. Once your dinos are sparkling clean, you can name them, very useful if you don’t know your triceratops from your protoceratops. My strongest is named Dave the Reasonable Dinosaur, only to make the most of the 28 characters allowed in a name. 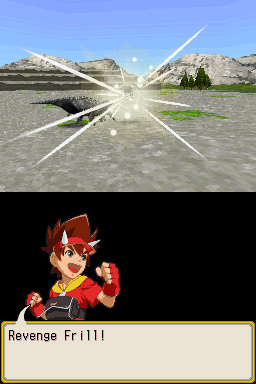 For all its good qualities though, Dinosaur King lets itself down with a few simple mistakes. Chief amongst them is the huge amount of random battles in the overworld sections; often you can’t walk more than seven or eight steps without being interrupted, and even though there are teleporters and items that prevent random battles you shouldn’t need to use them. At least you can turn off the in-battle cutscenes, which speeds up the fights you can’t avoid, but even so you’ll soon find yourself spending 70% of your time bashing the A-button to skip through battle scenes. Although the battles begin poorly, they soon become much more tactical, and the cutscenes are accompany each move are nicely animated and very entertaining to watch. The DS’s features are used reasonably well, with the option to trade items over Nintendo Wi-Fi Connection, and the touch screen makes navigating the battles as easy as could be. It’s just a shame that there are so many battles to navigate: we timed a section and found we didn’t even manage seven seconds between battles; imagine that repeated over the whole game. It’s the crucial flaw that makes it so hard to enjoy Dinosaur King in anything other than very small doses, even if you do really, really like dinosaurs. I agree, but at least with Pokémon there's the chance of seeing a rare monster you can capture - in Dinosaur King there are rare machines transporting loads of EXP, but that's all you can gain from fights. There's no option to run either, so you're forced to kill or be killed in every single fight during the game! Hey James I like Your Review.